I remember how intimidating it was. I was 6 months pregnant, and all I wanted to do was give my husband a sweet Fathers’ Day gift. I wanted to find the perfect gift. Nothing extravagent (afterall, I was the one carrying the baby). And at that time I didn’t know about my upcoming obsession with all products baby. Diaper bags were nothing to me. Neither was cute clothing. What finally appealled to me was an adorable book. One that brought tears to my eyes, but only because I was hormonal. When he pulled “What Dad’s Can’t Do” from his gift bag, he looked at the title and tossed it aside. “Hmmph,” was his comment. “That’s positive. A book of things I can’t do. Great.” Later that evening, I caught him reading the book, warmly smiling. You see, his family and mine were around at gifting time. He wasn’t about to get warm and giddy–he still had that un-daddy macho rep to protect. 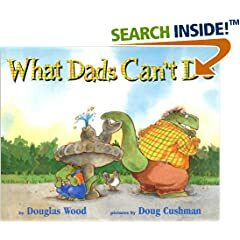 In this story, a Daddy and little boy dinosaur illustrate all the things Dad’s really can’t do, like “cross the street without holding hands” and “go to bed without a kiss goodnight.” Still a favorite in our home, I overheard him reading it to the kids before bed last night. Douglas Wood and Doug Cushman have also created What Mom’s Can’t Do and What Grandma’s Can’t Do. « Mr. Ray: Music for the whole family!